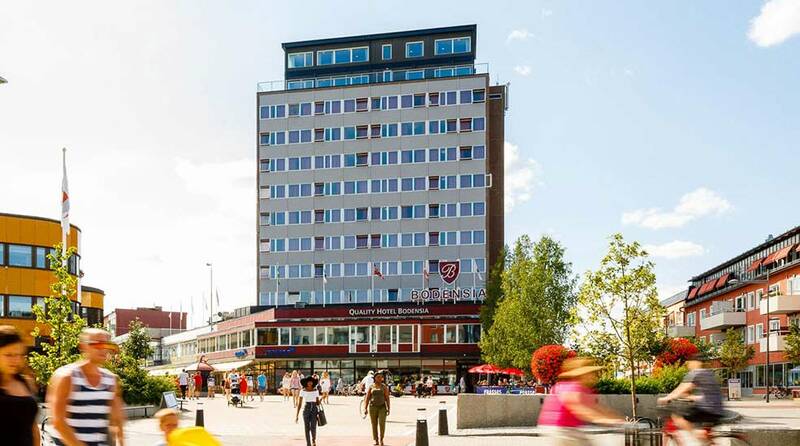 The Quality Hotel Bodensia is a modern hotel in the heart of Boden, featuring five flexible conference rooms, a restaurant and a two-floor relaxation area. This is an ideal hotel for professional business meetings and wonderful weekends away. We serve a tasty breakfast buffet with lots of healthy options. A proper hotel breakfast! Breakfast is always included in the room rate. Contact reception if you need to check out before breakfast and we will organise something for you. There is a multi-storey car park right next to the hotel which costs SEK 80 per 24 hours. The hotel offers a wake-up call service which can be booked using the phone in your room. At Quality Hotel Bodensia we always offer our guests complimentary tea and coffee in the lobby. Bring your best friend along! Pets are always welcome at Quality Hotel Bodensia for a fee of SEK 250 per stay. But remember to tell us when you make your reservation, so we can make sure you're properly looked after. Our free WiFi can be accessed from anywhere in the hotel. Drop by reception for the access code.